Collecting rocks from summer trips is my childhood hobby. The beautiful rocks have great memories attached to them. One day while admiring them I decided to make them look really unique and different by painting them . The shape of the rock should be kept in mind before choosing the pattern to be painted. Suppose the rock is oval then a lady -bug would look good on it and so on. Messages can also be written on them if they are large enough. 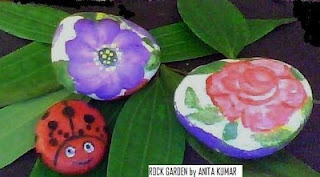 After painting them ,the rocks can be varnished and used as paper weights.